One of country music's rising stars releases his debut album. Dawson co-wrote all 12 of the album's songs, including the title track. The up-and-coming singer-songwriter collaborated with top songwriters Luke Laird, Josh Kerr, Barry Dean, Seth Ennis and more on the project. 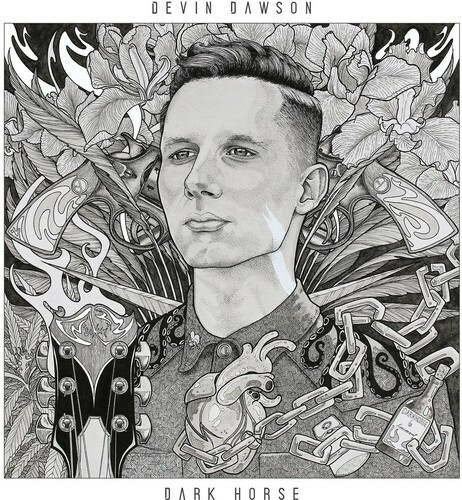 An atypical country artist, Devin Dawson's approach to music is not different on purpose, it's different with purpose. He grew up just outside the gates of Folsom Prison, drawing inspiration from Johnny Cash, Alan Jackson, Marvin Gaye and Creedence Clearwater Revival. Pulling from these influences, he began to write in a style that is definitively country. Dawson's lyrics full of romance and vulnerability, delivered with a distinctive saw-toothed vocal, draw you in from the first verse and keep you hooked until the very last chord. Customer evaluation for "Dark Horse (LP)"